Categories: For Her, For Him, Gifts, Lounge, Xmas Shop. 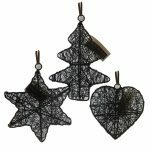 These stocking hangers would look great around the home at Christmas they could be stood on a mantlepiece or maybe in a child’s room to add that Christmas feel. Each stocking hanger is weighted as to not move when a stocking is hung on and the underside is covered with velvet-like material as to not harm any delicate surfaces.